MANCHESTER, UK, June 7, 2018 (ENS) – British scientists are using the latest in 4D technology to predict the behavior of lava flows and what that means for volcanic eruptions. 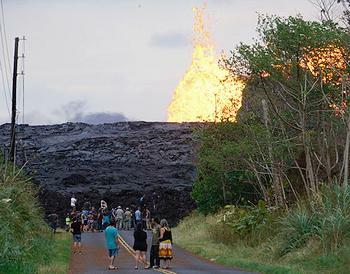 The findings explain why some lava flows move slowly yet others can cover kilometers in just a few hours, highlighting the hazard posed by fast-moving flows that often pose the greatest danger to people living close to volcanoes. The research, led by the University of Manchester, is studying the processes which happen during crystallization in basaltic magmas using 4D synchrotron X-ray microtomography. Led by Professor Mike Burton, Chair of Volcanology at the University, the research team monitored crystallization in magmas, a fundamental process that drives eruptions and controls different kinds of volcanic activity. Using this novel approach and technology they can, for the first time, watch the crystals grow in 3D in real-time, simulating the behavior of lava flows once a volcano has erupted. 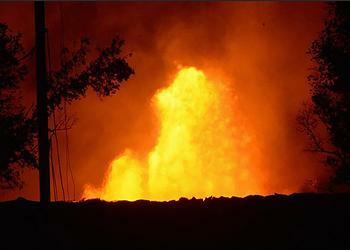 The process is similar to scenes witnessed at the eruption of the Kilauea Volcano in Hawaii. To study the rate of crystal growth the team set up a sample from a real eruption in a high temperature cell, before performing X-ray CAT scans while controlling the temperature of the magma. This allowed the team to visualize the formation and growth of crystals, and measure how quickly they grew. Using this method and technology researchers can collect hundreds of 3D images during a single experiment. This data is then used in complex, numerical models to fully characterize the behavior of volcanic eruptions more accurately. This isn’t the only use for such technology in geosciences. A 2017 study shows it has been used to investigate: (i) high temperature, observing in situ oil shale pyrolysis; (ii) low temperature, replicating the generation of permafrost; (iii) high pressure, to study the invasion of supercritical CO2 in deep aquifers; (iv) uniaxial stress, to monitor the closure of a fracture filled with sand in shale; (v) reactive flow, to observe the evolution of the hydraulic properties in a porous rock subject to dissolution.